On September 13th, Ambassador Liu Xiaoming hosted a reception to bid farewell to Minister Chen Xiaodong and welcome Minister Qin Gang. Over 150 people, including Mr. Scott Wightman, Director for Asia-Pacific in the Foreign and Commonwealth Office, Mr. Mark Hendrick MP, Chair of All Party Parliamentary China Group, Mr. Stephen Perry, Chairman of the 48 Group Club, and other representatives from the British Government and various sectors, diplomatic missions in <?xml:namespace prefix = st1 ns = "urn:schemas-microsoft-com:office:smarttags" />UK and overseas Chinese, attended the reception. 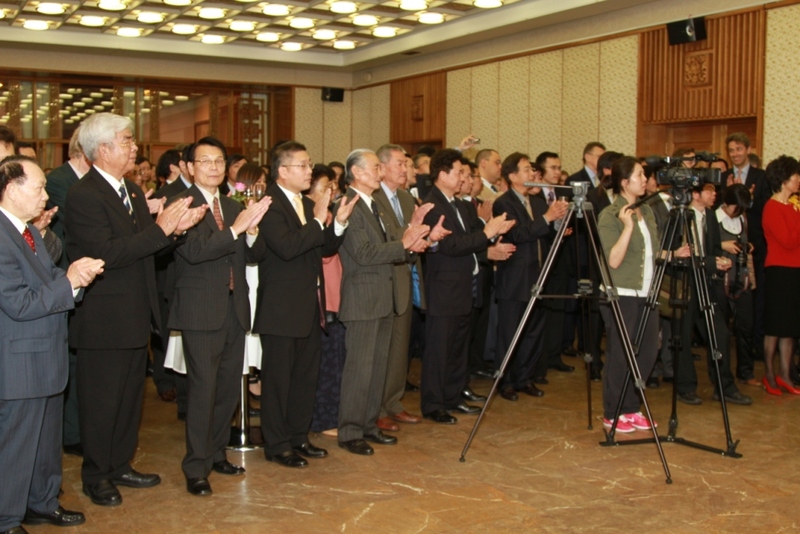 In his remarks Ambassador Liu said he was sorry to say goodbye to Minister Chen. He spoke highly of Minister Chen's great efforts in the promotion of the China-UK relations and the development of the Embassy, saying that he was glad to have such a good colleague and friend, and sincerely wished the Minister the best of luck in his new endeavours. Ambassador Liu welcomed the arrival of Minister Qin and said that the Minister has brought with him his knowledge, insight and experience of Britain and of its people, and that he will for sure do a good job as Deputy Head of Mission and make greater contribution to China-UK relations. The Ambassador thanked all sectors in UK for their support and assistance to Minister Chen, and hoped that Minister Qin could continue to enjoy the strong support and cooperation. He said that today China-UK relations stand at a new starting point and are blessed with new opportunities. China is ready to work with UK to grasp these opportunities to expand exchanges and cooperation and take the relations between the two countries to a new level. 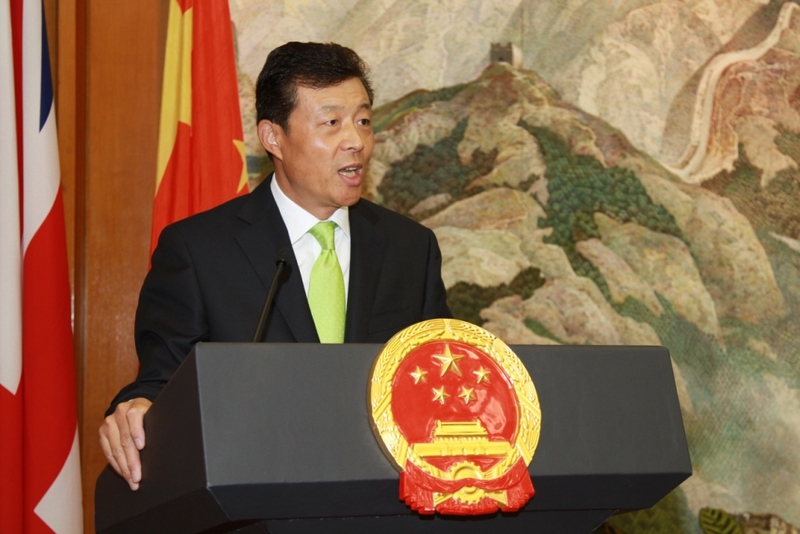 Minister Chen expressed in his remarks his sincere gratitude to Ambassador Liu and his predecessor Ambassador Fu Ying for their guidance and support. He said that he was pleased to work with Ambassador Liu twice and that he benefited a lot from this good teacher and friend. He thanked the colleagues of the Embassy and the Consulate General, the British Government, all his friends and overseas Chinese for their support and assistance over the more than two years, and said that he would never forget the friendship with everyone and the good days in London. Minister Chen also wished Minister Qin every success in his work and hoped he would continue to enjoy the strong support and cooperation from all sectors in the UK. 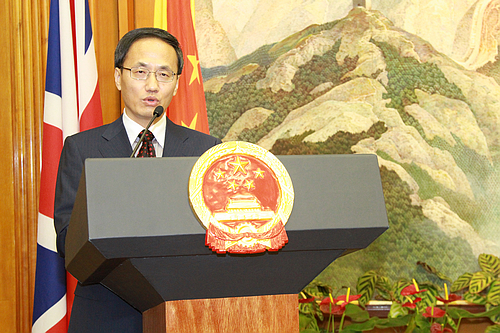 Minister Qin said in his remarks that he felt lucky and a great responsibility for his third posting to London. 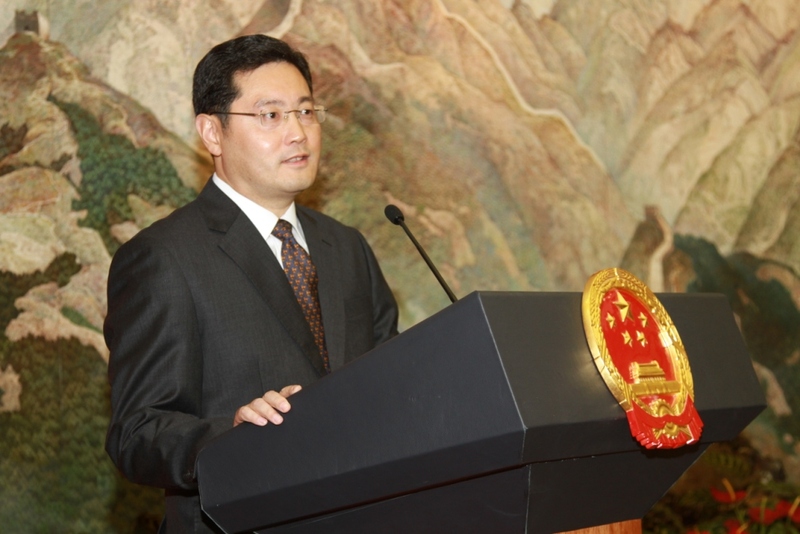 As an assistant, he would fully support Ambassador Liu's work, and he believed that he would receive strong support and guidance from Ambassador Liu and vigorous assistance and cooperation from friends and colleagues in the UK. The excellent work of Minster Chen in the past over two years has set a high bar for the successor. He is ready to do everything he can to work together with the colleagues and people from all sectors in the UK for a greater development in China-UK relations. Minister Qin wished Minister Chen great achievements in his new position. Mr. Perry conferred Minister Chen the title of "Icebreaker" on behalf of the 48 Group Club, and presented him with an honorary award plate. Perry said that the more than two years of Minister Chen's office term is the time when China has been rising on the world stage, and when the country's relations with UK and with the rest of the world have seen great development. 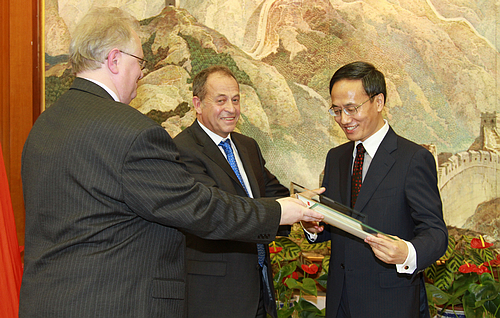 The honorary title of "Icebreaker" conferred by the 48 Group Club to Minister Chen is to recognize and appreciate his prominent contribution to China-UK relations. Perry congratulated on the arrival of Minister Qin, and he hoped and believed that Qin would make greater contribution to the further development of China-UK relations. All the guests bidded farewell to Minister Chen and expected his continuous interest in and new contributions to UK-China relations; and they also wished Minister Qin every success and greater achievements in the new position.